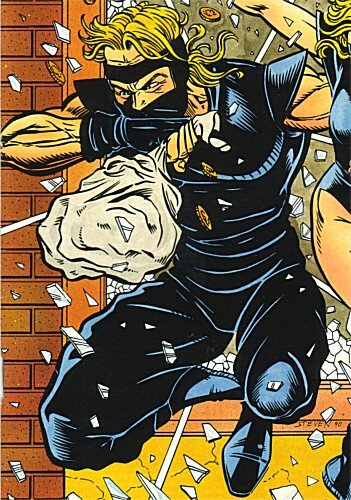 Powers/Abilities: Skilled burglar, acrobat and martial artist. History: Jerry was a New Orleans cop who felt that he had been unjustly treated by his department. He turned to burglary as a way of getting back at them, eventually acquiring a partner (Mouse) and training from Kunoichi of the Yakuza. When the Yakuza sent the pair into a Mafia ambush, they went independent, only to have their former employers send the assassins Tooth and Nail after them, and later Skull and Crossbones. Comments: Created by Roland Mann and Steven Butler. After first appearing in their own title for the short lived EFGraphics, Cat and Mouse found a new home, appearing first in Ex-Mutants #14 (preview short story, Eclipse Comics) before regaining their own title at Aircel in March 1990, a series which lasted 18 issues.